Israel has opened a road connecting areas of illegal Jewish settlements in the West Bank with Jerusalem, making settler access from the occupied Palestinian territory to the holy city easier. Route 4370, which had been closed and out of use for years since it was built over a decade ago due to staffing disputes between the police and army, was opened to traffic yesterday and is the first part of the eastern ring of Jerusalem. It will significantly ease congestion around northern Jerusalem by providing an extra or alternate route to the city from the illegal settlements. The new route will also redirect Palestinian traffic through a new security checkpoint en route to Jerusalem and away from an existing road in the unbuilt area of E1 in the West Bank, effectively separating Palestinians and Jewish settlers from using the same routes. Since US President Donald Trump recognised Jerusalem as the new capital of Israel in 2017, Israel has been increased projects and initiatives which prepare for its annexation of large parts of the occupied West Bank, critics have warned. A pension firm in the Netherlands has removed five Israeli banks from a blacklist it previously created in support of the Boycott, Divestment and Sanctions (BDS) movement. The firm PFZW – (Stichting Pensioenfonds Zorg en Welzijn, also known as PGGM) – is the second-largest pension fund in the Netherlands and regularly invests its assets overseas. PFZW had previously invested in a number of Israel’s major banks but in 2014 divested from these organisations in support of the BDS movement, citing “ethical concerns” over the banks’ presence in the occupied West Bank. However yesterday Dutch-Jewish newspaper Nieuw Israelietisch Weekblad (NIW) revealed that the Israeli banks – including Bank Hapoalim, Bank Leumi, Bank Mizrahi-Tefahot, First International Bank of Israel and Israel Discount Bank – have been taken off the blacklist, suggesting they are once again eligible for PFZW investment. Though NIW did not offer an explanation as to why the banks were removed from the blacklist, the newspaper mentions that PFZW’s initial decision to blacklist the banks was influenced heavily by Cornelis (Cees) Flinterman, a long-time BDS activist who was appointed to the pension fund’s Advisory Board for Responsible Investment in 2007. Flinterman is no longer listed as a member of the board on PFZW’s webpage, suggesting that his absence may be significant in PFZW’s decision to backtrack on its original decision. Although MEMO reached out to Flinterman for comment, at the time of publication no answer had been received. Though PFZW’s decision will be seen as a blow for BDS, in recent months the movement – which calls for a boycott of organisations complicit in Israel’s illegal occupation of the Palestinian territories – has seen a number of high-profile victories. In December, major banking firm HSBC announced that it has divested from Israeli drone manufacturer Elbit Systems, which sells weapons to the Israeli military. HSBC’s decision came after a coordinated campaign which saw over 24,000 people email the bank with concerns over its investments in Elbit Systems, as well as monthly picketing campaigns outside scores of the organisation’s UK branches. HSBC had also come under pressure from its own investors, including the University of Leeds which in November became the first UK university to divest from firms supplying the Israeli army. Following a student campaign, the university made the decision to divest from three companies which were found to be complicit in the violation of Palestinian human rights: Airbus, United Technologies and Keyence Corporation. HSBC was placed under review by the university’s investment managers for its provision of loans to Elbit Systems, Caterpillar and BAE Systems, all of which sell weapons and military equipment to the Israeli government. Thousands of Palestinians took to the streets of Ramallah yesterday to protest against the social security law proposed by the Palestinian Authority (PA), Arab48 reported. Despite heavy rains, thousands of the protesters gathered in the main square in the centre of the city, holding umbrellas, and called for the PA to cancel the law, not simply modify it. The protest started with the Palestinian national anthem and reading from the Quran. According to the news website, protesters called for ousting the government, as well as delegitimising the Union of Syndicates of Palestinian Workers over its collusion with the government. According to the new law, all workers are subject to the same percentage of contribution to the Social Security Corporation, with no clauses which provide for workers who receive minimum wage. Additionally, the families of Palestinians killed by the Israeli occupation may not be eligible to receive benefits from the Social Security Corporation which limits benefactors to those who have lost a family member to natural causes or “due to work injury”. READ: What would a Palestinian state look like? The Palestine Solidarity Campaign has won the right to challenge the Court of Appeal judgement which upheld the government’s right to restrict Local Government Pension Schemes (LGPS) from divesting contrary to UK foreign and defence policy, thereby limiting the possibility of divestment from companies involved in Israel’s human rights violations. In 2016, the Department for Communities and Local Government’s issued guidance which prohibited Local Government Pension Schemes (LGPS) from divesting from foreign nations and UK defence industries. This included a prohibition against disinvestment in companies on the basis that they trade in products produced in the occupied Palestinian territories, for example, even if this was the will of the LGPS members. In June 2017, PSC brought a Judicial Review challenge which resulted in the Administrative Court ruling that the decision to prohibit LGPS funds from this kind of disinvestment was unlawful. The Court of Appeal then overturned the Administrative Court’s decision at a hearing in May 2018. PSC has now been granted permission to appeal this judgement at the Supreme Court. According to Bindmans LLP, PSC’s solicitor, approximately 1 in 3 cases that apply to the Supreme Court get permission to appeal in this way. It is likely that a hearing will take place in the second half of 2019. It is noteworthy that, in his judicial review circa 2017, Administrative Court Judge Sir Ross Cranston determined that the government had acted unlawfully by attempting to restrict local councils from pursuing BDS against foreign nations (such as the state of Israel) and UK defence companies through their pension schemes, on the basis that the secretary of State was acting for an improper purpose. The Government’s guidance was announced by the Department for Communities and Local Government in September 2016, specifically to curtail divestment campaigns against Israeli and international firms implicated in Israel’s violations of international law, as well as to protect the UK defence industry. This occurred despite a public consultation indicating that 98% of respondents thought this was the wrong thing to do. Pension holders would have been forced into investing in companies that are complicit in human rights abuses contrary to their conscience and beliefs. In December 2016, The Palestine Solidarity Campaign applied for judicial review of the new government measures for LGPS. The claim was upheld by the High Court in June 2017. The Commission of Detainees and Ex-Detainees Affairs stated that Palestinian detainees being held in the Israeli detention center of Etzion are subjected to extreme cold, under frigid weather conditions, lack of blankets and winter clothing, and scarcity of medical care. The Commission quoted its lawyer Jacqueline Fararja, following her visit to the detainees, on Tuesday, as saying that conditions of the detainees are catastrophic, adding that she met with the prisoners, and they are shivering hysterically, of intense cold. It added that the lawyer pointed out that the prisoners were wearing thin clothing that was given to them by prison administration, at a time when the administration is also depriving them of blankets, winter clothes and heating facilities. The detainees confirmed to the lawyer that living conditions in the detention center are intolerable, adding that their health status is in a clear deterioration, with most of them falling ill with colds and flu. The prisoners also told the lawyer that the health status of some prisoners has been aggravated, due to freezing cold, as it was with Osama Salhab, 20, who was assaulted by Israeli soldiers and wounded in his right leg, which resulted in the leg swelling in the freezing cold, with the administration providing him no medical relief. The lawyer also said that the prisoners complained over the quantity and type of food provided to them, showing that meals distributed to them are too cold and of poor quality, whereas most of the prisoners eat only enough to meet their needs for subsistence. Al Ray further reports that the commission warned of the ongoing recklessness of the administration, toward Palestinian detainees, and of the abuse and imposition of difficult living circumstances, in open disregard of international conventions and human rights principles and laws. 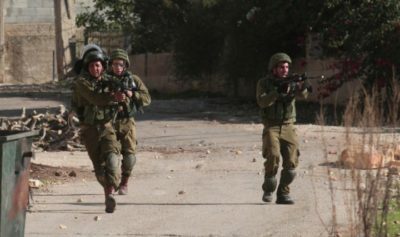 According to the Wafa News Agency, Israeli forces transferred a Palestinian man to a hospital after severely beating him in his house in Abu Shkheidim village, northwest of Ramallah, said an attorney on Wednesday. Mamon al-Hashem, an attorney representing Palestine Prisoner’s Society, said that Ziyad Mohammad Shalalda, a 45-year-old resident of Abu Shkheidim village, was rushed to Shaare Zedek hospital after being severely beaten and detained by Israeli forces. According to al-Hashem, Shalalda has been held at the hospital and denied access to a lawyer since his detention. Al-Hashem could not ascertain any details about Shalalda’s health condition, but pledged that PPS would take necessary legal proceedings to learn about it. Shalalda was detained along with his son, Mahmoud, 21, during an Israeli military raid into Abu Shkheidim during which soldiers detained Assem Barghouthi, suspected of carrying out an attack which killed two Israeli soldiers on December 13. This story was originally published by the Wafa News Agency.